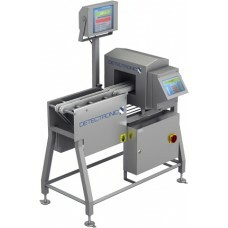 DETECTRONIC multi check weigher is a combined solution with the usage of a metal detector and a check weigher fitted into one operating machine. When investing in DETECTRONIC multi check you get your check weighing and metal detection issues solved by one machine. This allows you to gather your production processes and herby safe time and money. DETECTRONIC Multi check application can be used in almost any type of food processing production and it comes with a vast variety of rejection systems which can easily be applied to suit your production line and products.